Peel Off Face Masks are made not only to peel the layer of dead skin off your face but also to give you radiance, and clear skin in just a jiffy. They are also the reason why your skin will remain bouncy and fresh. They remove blackheads and cleans pores. The benefits don’t end here; they help the blood circulation too. There are peel off masks to help you with many skin issues that you might face. While there are masks that help you get rid of blackheads, there are also masks that make you look fairer. There are masks that promote the blood circulation and make you look younger and fresh, giving you a supple skin. The aisles are full of these products, but most of them are chemically synthesized. The chemicals used in the products can be harmful to the people who have sensitive skin. There are certain components of the face peel that might not suit your skin type, and that may leave redness and mild inflammation. It is very important that you apply the face peel masks to a patch of your skin first, to see if the product suits your skin type. There has been a standing debate on whether the peeling masks are effective or a marketing gimmick, and almost everyone has a say in it. Lindsay Goodrich, a nurse, and aesthetician in Chicago’s Northwestern Memorial Physicians Group, maintains that the idea of peel-off masks sells more than the concept. As the women pull off the masks off their faces, they feel satisfied in thinking that they are getting rid of a layer of dirt and dead skin, while it is not necessarily so. Having said that, there are also plenty benefits of the mask. The vitamins and plant-based antioxidants in the masks are beneficial for the skin for the long term. There are masks for every skin type. There are components that don’t always suit the skin types that there are, so identify your skin type and select the mask that suits it the best. People with sensitive skin should stray clear of face-masks and peel-offs altogether as they have an abrasive quality that might harm the skin more than providing goodness. There’s a different mask for every problem that you might be facing. While it is not guaranteed that you will see the effect immediately, know that there will be a positive change in your skin, even if it is in the long term. There are masks meant to remove blackheads, masks meant to give you a brighter and clearer skin, masks that are meant to rid you of the acne scars, or simply to provide exfoliation to the skin, or cleaning out the pores. While there are several over-the-top cosmetic products in the market, not all of them are ideal for all skin types. Some of them might cause you more harm than good. Keeping that mind, we have included below the different kinds of face peel-offs that you can very easily make at home. That way, you will know what you’re applying, and you can be the judge of if suits you or not. Blackheads are pesky and undesirable. They are the spots, dots or the pimples that appear on your face, more noticeably on the tip of your nose. There are many women and men out there who are affected by the presence of these seemingly harmless dots. While several beauty parlors and salons offer plenty of products and services to get rid of these, they make an appearance over and over again. To keep this problem at bay, we have mentioned below the different peel-off masks that you can easily make at home in a short while, with only the products that you commonly see at the stores. Both Honey and Milk have been known since ages to among the most influential organic products when it comes to any issue. Honey is known across the globe for its antiseptic properties and healing qualities (1). Milk is the gentle and the mild exfoliator for sensitive skin types and will be ideal for the women who wish to get rid of blackheads in a gentle way (2). The best part about the face peel-off mask is that it doesn’t require gelatin, but only two very basic ingredients. Below is the recipe, and the process to go about it. Mix honey with a dash of milk and warm it. Mix the two components together till they turn into a thick paste consistency. Using a cotton ball, apply it over your face, and nose liberally. Apply a thin strip of cotton over the places where you have applied this paste, and let dry. Let it be for twenty minutes, and peel the strip carefully from the face. You feel instantly see your skin glow and radiant, in the absence of those unwanted black spots dotting your nose. Wash your face and apply moisturizer. Milk comes with a lot of benefits to the skin and the health. It is very good for exfoliation and makes your skin smooth like never before (3). Hence, it used in most recipes. Milk also removes the tan, if any, from the skin, and helps get rid of hyperpigmentation at a faster rate, leaving your skin with an even-toned complexion. Gelatin helps milk in sticking to the skin and turning elastic, so it becomes easier to peel off. This method will make sure that you get rid of those blackheads in a jiffy, without much mess, and get a smoother skin in the process. The first step of the process is to add Gelatin in a dry and clean bowl. Add 2 to 3 spoons of milk in it. Heat this mixture for about 30 seconds in the microwave or till it reaches a creamy consistency. If you don’t have a microwave, you can just use a double boiler. Using the brush, apply carefully on the face. Make sure that you keep the mixture away from eyes, hairline, and eye-brows, as peeling it off will be painful in hairy areas. Let the mask be for about 30 minutes, or till it completely dries. Peel off the strip slowly and carefully in an upward motion. You will instantly see your face shine and feel smooth. Apply a toner, and moisturizer after washing it with warm water. You will find many face masks that involve the use of egg whites. This is because egg whites are miraculous, and they have many properties that will make your skin supple and soft (4). Egg whites have astringent properties that help a lot when you need to shrink your pores and need to remove blackheads (5). It is the ideal recipe for the women and the men who are tired of squeezing the dots every now and then. The recipe also involves the use of lime juice. Lime juice brightens your skin and gives you an even-toned complexion. The recipe is fairly easy. All you have to do is take a clean bowl and mix together Lime juice and the egg white. Mix it thoroughly till it evens out. Using the brush, carefully apply the mixture to the affected areas. Keep away from eyes and eyebrows. Gently apply a layer of tissue over the face, on top of the egg whites and lime juice mixture. Cover the area neatly. Let the mask dry and sit for around 10 minutes. Meanwhile, you will feel your skin tightening. Carefully remove the mask in an upward motion. Be gentle and slow. Wash your face with lukewarm water, and apply moisturizer. You will see a stark difference as the pores shrink, and there is an obvious absence of blackheads. Cinnamon is considered to be under the category of superfoods. It has several winning qualities. Not only is it good to consume, but the topical application also proves to be beneficial. The spice is loaded with antimicrobial benefits (6). There are also antioxidant qualities found in it. It makes the pores shrink, and will make those blackheads disappear for good. Honey is known for its healing properties all over the world. It also provides much-needed nourishment to the skin, and it is a part of many cosmetics for the same reason (7). The recipe below will make you bid farewell to the blackheads for a long time, with no side effects or inflammation. The process to make this mask is very simple and easy to follow. Take a clean and dry bowl, and put equal portions of honey and cinnamon in it. Mix them thoroughly till you see a homogeneous mixture. Lather it to the affected areas, or even the whole face. Keep the mixture away from eyes. Gently press a thin lining of cotton strips over the mixture, to the face. Wait for five minutes before removing the strips carefully from the face. Wash face with warm water, and apply moisturizer. You will notice an immediate difference in the skin. The skin tone will be even, and there will be hardly any blackheads. Honey makes the skin smooth and fresh. Turmeric is one of the best organic component for both consumptions, as well as topical application. Turmeric has more than 300 oxidants found in it (8). There are a plethora of benefits that you can reel in from this one magical ingredient. It is very helpful in making the skin clearer. It solves acne problems, and the consumption helps fighting lots of health problems. Mint, on the other hand, provides freshness to the skin (9). It regulates the oil distribution and cleans out the pores. Gelatin makes the blackheads stick to the mask so that they can be removed easily at the time of peeling. Boil some water, drop the mint leaves, and let it simmer for a few minutes. Strain the leaves, and in the water add turmeric powder as well as gelatin. Mix thoroughly till you see it become a paste. Wait for a few minutes to let it cool off. Lather the thick paste on your face, or the affected areas. Allow the mask to dry for 15 minutes. Gently peel off the mask in an upward motion. Clean the tiny specks using cotton swabs. Wash the face is with warm water and moisturize. You will your skin get clearer and neater. The gelatin pulls out the blackheads, leaving your skin smooth and glowing. There are many benefits of egg yolk. Not only is it excellent for consumption, it seems to have many nutritional properties that are beneficial for skin as well. Application of raw egg yolk to the face is not unheard, and it has been a vital part of many organic face packs and masks. The egg yolk in this recipe gives your skin the upliftment that it needs (10). The gelatin makes sure that the blackheads stick to the pack and are removed thoroughly at the time of peeling. 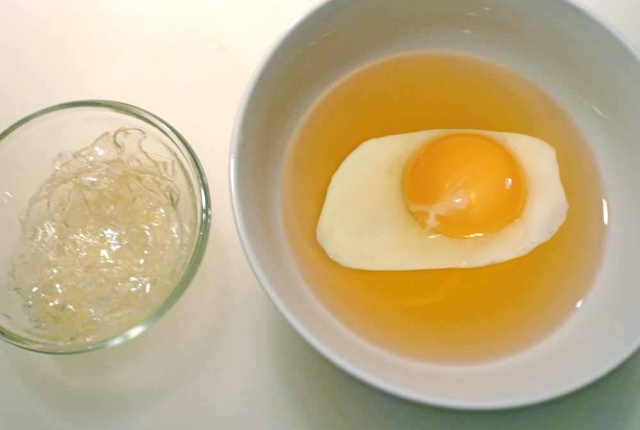 To get the egg yolk, crack the egg and put the contents in a clean bowl. Take an empty plastic bottle, press it so the air escapes, and with the vacuum formed, pick up the yolk. Place the yolk in another clean bowl. Add a teaspoon of gelatin to it, and mix thoroughly. Microwave the mixture for about 30 seconds and stir it occasionally. Let the paste cool, before applying it generously to the affected area, or the entire face. Allow the mask to dry. Peel it off gently, and wash the face with warm water. You will notice an immediate difference in the skin, as it becomes smoother and softer. The blackheads will be removed, leaving your skin supple, moisturized and clean. Acne has been among the most common problems faced by women all across the globe, every day. There are many treatments and cosmetics to treat acne, in the market. Several over-the-top drugs and chemically synthesized products claim riddance of this problematic issue. But with that comes side-effects. The chemical components in the masks and products might heal acne temporarily but can cause otherwise damage to the skin. These products might also not suit your skin type. Having said that, below we have included a number of easy recipes for making DIY peel-off face masks for acne at home, which will be gentle on your skin and will not cause too much damage. They are also formed out of the ingredients that are very easily found in stores. Pineapple may not be found too much in skin-care products but don’t let it fool you. Pineapple contains many beneficial nutrients such as bromelain which reduces swelling and inflammation (11). This comes in handy when dealing with acne problems. The fruit is also filled with essential vitamins and antioxidants. Honey, as told before, is full of healing properties (12). It nourishes skin and reduces the scars and pigmentation caused by acne. Take a clean bowl, and pour fresh pineapple juice as well as honey in it. Microwave the mixture, or put in on the flame for a few seconds till it becomes warm enough for the gelatin. Add the powdered gelatin to and mix till you see it become an even paste. Let the paste come down to a lukewarm temperature, but warm enough. Apply it generously over the affected area or the entire face. Allow it to dry, till you feel the skin tighten. Peel the mask off gently in an upward movement, and wash the face with warm water afterward. As you remove the peel, you will see an instant difference in the softness of your kin. Acne might not disappear immediately, but apply it once in a week, and you will see and obvious reduction in acne problems and severity. Cucumber is full of antibacterial properties that are wonderful for killing the root cause of pimples (14). The vegetable also has a lot of water content in it, so it proves to beneficial for skin by providing it moisture. The recipe below also includes green tea, which has a gentle and calming effect on your skin (15). The gelatin in it adds to the removal of blackheads, which is just a bonus. Peel the cucumber after washing it. Remove the seeds, and put it through the grinder till it reaches a puree consistency. Strain the puree so you can get the water content of the vegetable. Collect the water in a bowl, and microwave it for 30 seconds. If you don’t have a microwave, pour it into a saucepan and heat it over the flame. Add Gelatin to it and stir till dissolved completely. Take it off the flame and wait for it cool, or reach lukewarm temperature. Using a brush, lather a thick coat over your face. If needed, apply a second coat. Let it sit for 20 to 30 minutes, or till it dries out. You might feel some tightening on your face, but don’t panic, It’s just the gelatin drying. Peel the mask in an upward motion. Wash the face with warm water and moisturize. You will see an instant effect on the skin, as it gets smooth and supple. The recipe below contains egg whites, green tea, and lemon. All three of the products are high on benefits. Egg whites are filled to the brim with winning components that make the skin glow (16). They are also good for the tightening of pores. Green tea has a calming and gentle effect on the skin and provides the skin surface with healing properties (17). 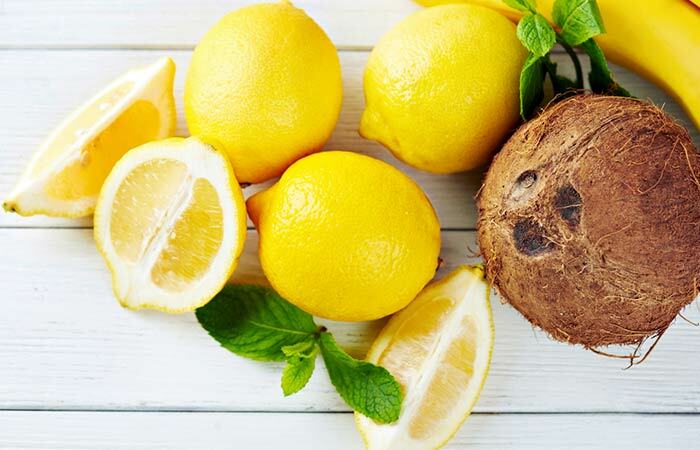 Lemon is acidic, but it is wonderful to fight off pimples. The extracts of are found in many over-the-top cosmetic products that are used to treat acne (18). The added gelatin makes sure that the mask can be easily peeled away. Whisk the egg whites till they turn foamy. In another clean bowl, collect the brewed green tea, and add lemon juice to it. Put the mixture in the microwave for about 30 seconds, and mix gelatin to the mixture. Stir till it turns homogeneous. Add the egg whites, and let it come down to room temperature. Using a brush, generously apply it to the face or the affected areas. Allow the mask to dry for 20 to 30 minutes. Apply another coat if necessary. After drying, peel it off in an upward motion, and clean the wayward bits by a cotton swab. Wash your face with warm water, and apply moisturizer. Yogurt is great for the skin for many reasons. It has nourishing properties that help to make the skin softer and smoother (19). Honey has several antibacterial properties that prove to beneficial when fighting from pimples or acne (20). Oatmeal has been a part of many organic face masks and scrubs, as the rough texture proves to be ideal for exfoliation. With so many healthy components, this face peel-off mask proves to be ideal for the people who struggle with acne issues. Prepare the breakfast oatmeal by adding milk to it, and heating over the flame for a few minutes. Add the yogurt to the mixture along with honey. Stir till it becomes a thick and creamy paste. Lather the paste on the affected areas or the entire face, and cover with a damp washcloth. Let dry for about half an hour, and keep the nostrils open for breathing. Peel away the mask as soon as you feel the skin tightening or when it dries. Swipe away the stray spots using cotton. Wash face with warm water, and apply moisturizer evenly. Lemon is ideal for you if you want to get rid of the pigmentation and scars caused by acne(21). It is also a wonderful exfoliator and bleaches skin as well, providing you with even-toned and a fairer complexion(22). Green Tea has a soothing and calming effect on the skin. This recipe of the DIY face peel-off mask will make your skin glow, and it will reduce the risks of acne popping out further. Take a clean bowl and warm up the brewed green tea in it. Tip in the gelatin and mix till you see it dissolve. Add the lemon juice to this mixture, and heat it up again. Let it cool back to room temperature. Whisk egg whites and add to the paste. The egg whites help in reducing the occurrence of pimples. Apply the mask evenly on the face, and let it dry for 30 minutes. When completely dried, peel off the mask gently and carefully in an upward motion. You will see a stark difference in the quality of your skin. The complexion will be fairer and even-tines. Use it once a week for long-term results. Who doesn’t want an even skin tone? Dull spots and pigmentation are found on every skin type, and just imagine how flawless your skin would appear in the absence of these tough spots. We have mentioned the face masks preparation that makes it easy to reduce the appearance of such dull spots, blemishes, and pigmentation, leaving your skin fair and even-toned. All the ingredients in the recipe are easily found in stores. The best part is that they’re completely organic, and you know what you’re applying to your sensitive and fragile skin. Glycerin is a wonderful ingredient when it comes to providing moisture (23). The even better quality of this product is that it locks the moisture in the skin, maintaining the texture to soft, smooth and supple. Milk, on the other hand, contains a plethora of healthy components that have antibacterial qualities (24). Milk also has exfoliating tendencies, so it helps fight off blemishes and marks on the face. The gelatin in the recipe helps make the mixture stick to the skin. In an empty and clean bowl, bring the milk to a boil. Add the gelatin to it and mix till you see the powder completely dissolve. Add glycerin to the mixture and let it cool down to the room temperature. Apply a healthy and generous coat of this paste. Add another coat after 5 minutes, if required. Allow the mask to dry. You might feel the skin stretch. Once dry, peel off the mask in an upward motion, slowly. Wipe your face with a damp and clean towel. You will feel a clear and distinct difference in your skin quality. Your skin will be soft, smooth and hydrated. Repeat the process once in a week for at least three weeks to see long-term results. If you want a smooth and clear skin, this recipe suits your needs the best. Lemon has Vitamin C as well as citric acid that makes your skin glow and brightens up (25). It also bleaches the skin, so you have an even tone. Coconut oil in the recipe acts as a wonderful source of moisture and hydration to the skin that it needs (26). Eggs whites help tighten the skin and make the pores shrink (27). The face mask is ideal if you want instant fairness and reduction in blemishes. Crack the egg, separate the yolk and whisk the whites in a clean bowl till they turn foamy. Add equal portions of Lemon Juice and Coconut Oil to it. Stir till it forms a thick mixture. Using a brush, lather on two coats of it. Gently press tissues on it, and let it sit. Allow the mask to sit for 10 to 20 minutes, before peeling if off the face. You will notice an instant glow in your face after. Use the mask once in a week for prolonged effects. Sometimes sticky oil present in the pores also takes away the shine and glow of the skin. This recipe is meant for the people who struggle with removing oil. Rose water acts as a fantastic astringent that clears up oil for good (28). Pineapple has many winning features that help to restore hydration to the skin as well as antioxidants that keep the skin fresh and young (29). Mix the pineapple juice and rose water together thoroughly. Heat it in a saucepan over flame, or microwave for 30 seconds. Add gelatin to it, and mix it till you see the gelatin dissolve completely. Let the paste cool down to room temperature. Apply a healthy coat over the face, but keep away from eyes. Allow the mask to dry for 30 minutes. Once, dry, pull the peel in an upward motion, carefully. Wash the remaining stickiness with warm water and apply moisturizer. You will see a balance of oil, and your skin glows radiantly. It has been proven beneficial over and again for the people with irregular oil distribution on the face. Green Tea provides the skin with many antioxidants that help retain its moisture (30). It also makes the skin smoother and clearer. Aloe Vera, on the other hand, can be found in many cosmetic products as it has vitamins and natural exfoliators (31). Since it is made up of 96% water, it provides the water content to the skin that it needs. This mask works very well if you use it regularly over a long period. Add aloe vera gel to the brewed green tea, and boil it over the flame. Tip in the gelatin and stir it till it dissolves completely. Apply a coat over the face, wait for 5 minutes before applying another coat. Let it sit for about 20 minutes. Peel away the mask in an upward motion, gently and carefully. Wash the face with warm water, and moisturize. Orange juice is used in many skin care and cosmetic products. The fruit is wondrous not only for ingestion but also for topical application. It is abundant as the source of Vitamin D and helps in clearing off acne and oily pores (32). The removal of these problems, hence, provides you with a radiant and glowing skin. Heat the Orange juice in a clean and dry bowl, in the microwave for about 30 seconds. If you don’t have a microwave, heat it in a saucepan over the flame. Tip in the gelatin powder, and stir until you see it completely dissolve. Let the mixture come down to room temperature. Using a brush, apply liberally to the face, and leave for 10 minutes. When dry, peel off the mask in an upward motion. There are some people who do not prefer the use of gelatin on the skin. While there are no studies suggesting that gelatin might be risky for topical application, it is always safe not to take chances. There might be a possibility of an allergic reaction to gelatin. The component does not necessarily suit all skin types. Therefore, we have included a list of recipes that don’t need gelatin and made entirely of the household supplements. Cucumber is an ideal component for getting clear skin. It has ascorbic acid and caffeic acid, both of which are ideal to help calm down the skin irritation as well as inflammation. Cucumber also hydrates the skin and locks the moisture in (33). Glycerin, on the other hand, makes the skin soft and smooth. It fights off the dry patches and leaves it conditioned. Wash your face with warm water and face wash. Mix the cucumber juice and glycerin, and stir into a homogeneous mixture. Using a brush, lather a thick coat on the face. Gently press the tissue paper on top of this coat. Allow it to sit for 10 minutes. Peel off the mask carefully, and wipe the remnants with a cotton swab. You will notice an instant effect on your skin without having to use artificially synthesized gelatin. The below recipe is ideal if you struggle with the problem of whiteheads. It is a very easy method to get rid of them for good. Honey has antibacterial as well as anti-inflammatory properties that provide to beneficial for sensitive skin (34). 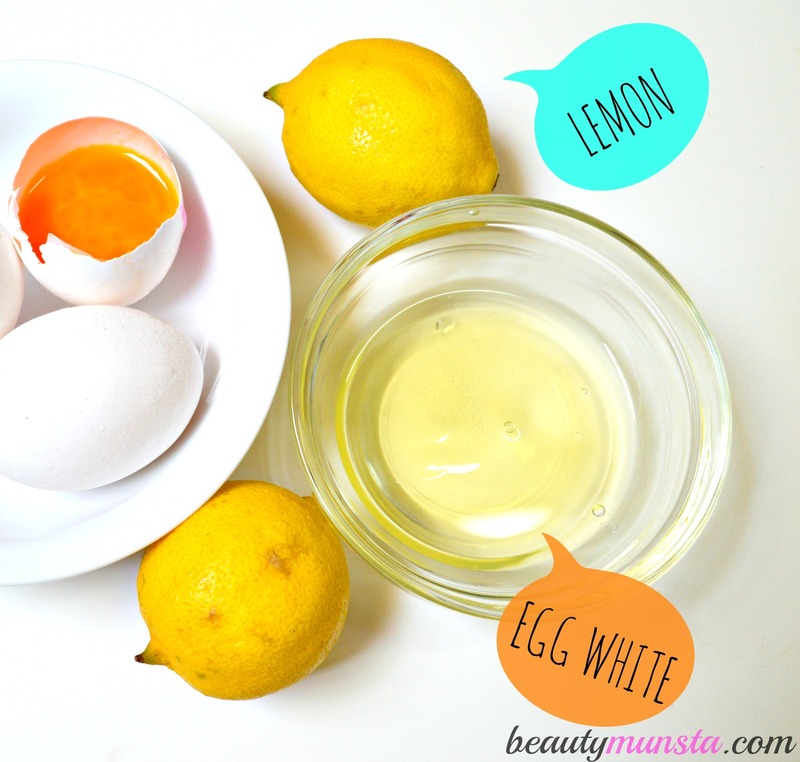 Egg whites are great for the deep cleaning of your pores, as well as their shrinking (35). If you have sensitive skin, then this is the ideal method for you. Separate the egg white from the egg yolk, using the method given above. 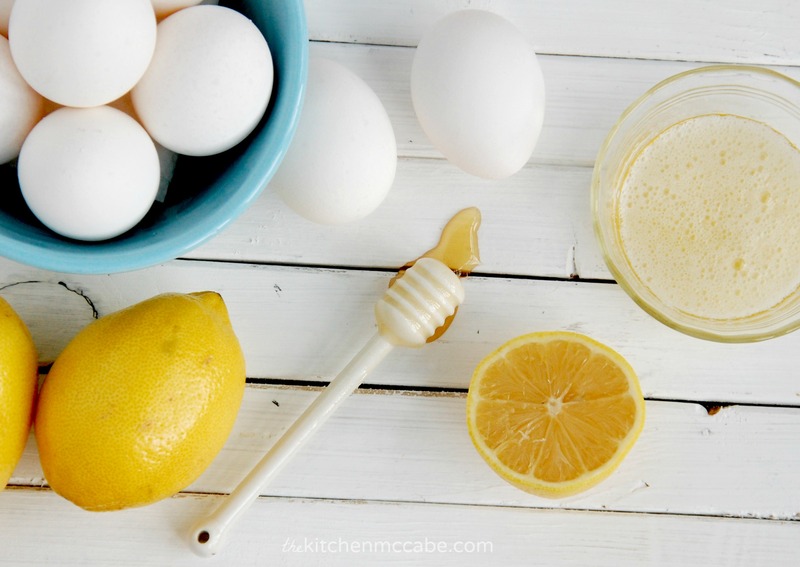 In a different clean and dry bowl, mix the egg white and honey. Stir it into a thick consistency. Using a brush, apply a thick coating on the entire face, liberally. Let it sit till it dries, or for about 15 minutes. Peel off the mask gently away, and wipe the strays with a damp washcloth. Using glue as your Face Peel-Off Mask might sound like an unconventional idea, but it works. The DIY peel-off has taken the internet by storm. 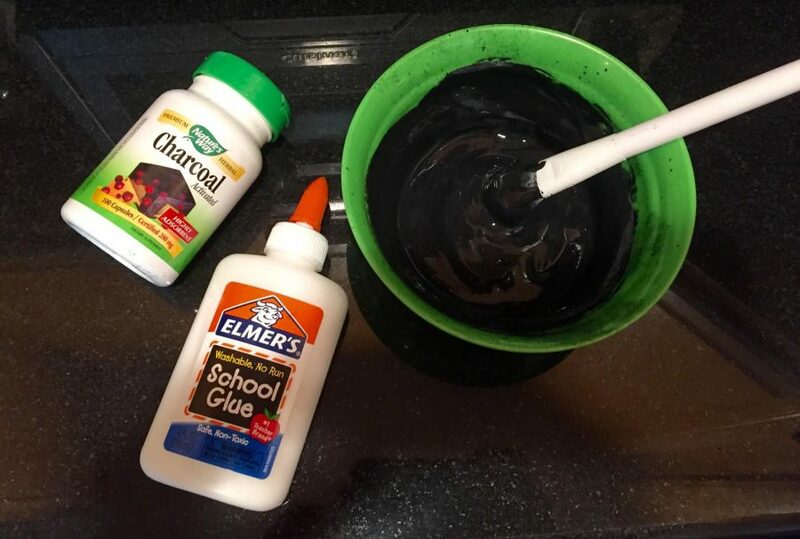 The best known and popularly used glue in most recipes is Elmer’s glue, but you can use other products too. Just make sure that they are non-toxic. Also, don’t forget to apply a little amount of it over a patch of skin to see it you have any allergic reactions to it. Mostly, it has been categorized as safe, as long as you keep it away from eyes. Lather a thick coat of the glue over the area peppered with most blackheads. Make sure you keep the glue away from eyes, as well as corners of the mouth, so you don’t accidentally ingest it. Let it dry for about 10 to 15 minutes. With great care, peel off the mask when it completely dries out. You will notice an obvious decrease in blackheads and dead skin of that area. By now, everyone has seen and wished for an activated charcoal peel-off face mask. The images have shown success in the removal of the most stubborn blackheads. Activated charcoal masks have been all over the internet, and have made big promises to cleanly remove any dirt in the pores. They have been most commonly used for the removal and extraction of blackheads as well as whiteheads. If you want, you can also buy the masks from the internet, or make a DIY mask yourself. The ingredients used in this mask can be easily found in stores or online portals. They are also all tried and tested and have minimum side effects on the skin. However, you should always put a small amount of any new product you’re trying on a tiny patch of skin, to see if you’re affected by it. Follow the below recipe to find the removal of whiteheads and blackheads made easy. 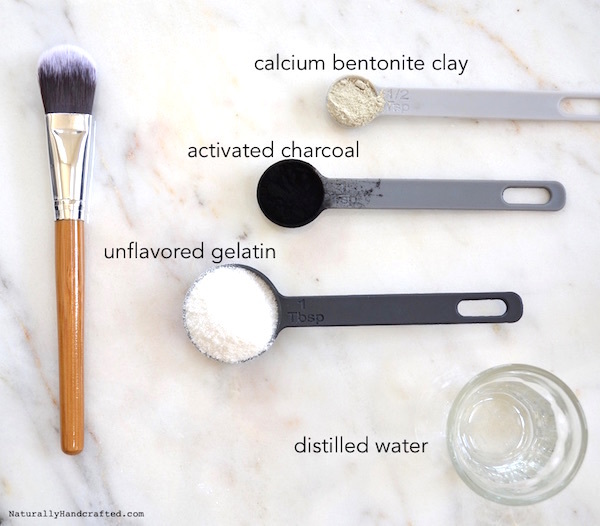 Take a non-metallic bowl, and pour Calcium Bentonite as well as activated charcoal in it, and give it a rough stir. Boil the distilled water in another utensil, or microwave, and pour in the mixture. Tip in the gelatin, and stir till you see it dissolve. You will a thick paste taking shape. Using a brush, lather the mask all over the face or over the affected areas. Keep away from hairy areas like eyebrows and hairline, as the peeling off can be painful for some. Apply two or three coats, as required. Allow the face mask to dry for about 45 minutes. You might feel a little bit stretching, as the gelatin shrinks up. As soon as you’re sure that the mask has dried, peel it off carefully in an upward motion. If it’s hurting too much, you can just wash it off. When you have removed the mask, you will see an instant effect in your skin. There will be an obvious reduction in the blackheads as well as whiteheads. The dead skin on your face comes right off along with the dirt in your pores. If you’re not able to find the ingredients mentioned in the peel-off mask recipe given above, you can follow this one, which is very quick and easy. It is known widely that activated charcoal is used to draw out impurities and toxins. It is used widely in many masks and peel-offs now, and there are instructions to make them at home as well. 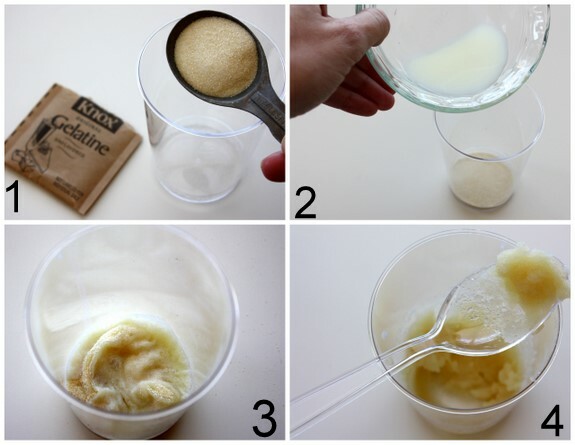 Below, we have mentioned a fairly easy way of making this mask, using just two ingredients. In a clean and dry bowl, mix both the ingredients till you see a thick paste taking form. Using an old makeup brush, lather a thick coat over the entire face, or just the areas with whiteheads or blackheads. The time duration that you need to let this mask cool for depends entirely on the layers you have applied. Allow the mask to dry off for at least 45 minutes. Peel it away from the skin in an upward motion. Be careful, as the areas with hair might make the process a bit painful. You will find that the dead skin comes off with the mask, and there is an obvious absence of impurities. The skin also feels freshly hydrated and clean. Peel-off face masks are very satisfying. Studies have found that the feeling of peeling away the mask gives more satisfaction than the removal of actual dirt in the pores. It is the act, which is enjoyed more. However, it does not mean that the masks have no effect whatsoever. These organic homemade face peel-off masks are sure to help you get rid of the skin problems that continuously face. Your skin will be soft and smooth like never before, ridden of the pesky blackheads, whiteheads, and the impurities found in the pores. The best part? These are all tried and tested, so you will not have any complaints. Keen interest and inquisitive regard drew her to home remedies. Having experience and knowledge of the healthcare field, Anusha believes she can bridge the gap of healing, using home-available treatments. I highly recommend the honey and cinnamon mask. I DONT EVEN HAVE GELATIN! Is the mask meant to dry down so it peels off like wax because that was the sort of mask I was looking for? I tried the honey and cinnamon mask and it made my acne scabs go away! I did this 3 times a week. Great to know that the honey cinnamon mask worked for you. Glad that you shared. Hello mam, my skin is very oily, more blackheads and pimples on my nose please give me some good solutions. I am naturally wary of all skin care products – lots of grand claims, but few products do anything for my acne-prone skin. BUT I found a mask THAT WORKS. Its the Made from Earth Beetroot Mask. I immediately saw visible results in one application. It leaves skin feeling softer and draws the excess oil out of my pores (I know, ew). Its in powder form, so you have to mix with water but 100% worth it. Good luck to you! Very informative! I have a need to try these face mask for treating my blackheads. Thanks a lot for sharing the wonderful article. It is very informative information. Thanks for sharing.